There is a strong scientific consensus that climate change is happening and that human activities have played a contributing role. The main questions today concern what steps can be taken to mitigate the warming trend and help communities and regions adapt to the present-day and anticipated impacts of the warming that already is occurring. 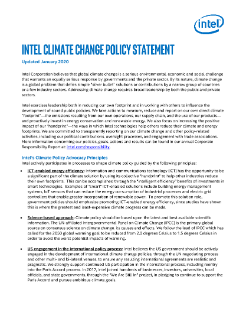 Intel Corporation believes that global climate change is a... serious environmental, economic, and social challenge that warrants an equally serious response by governments and the private sector. By its nature, climate change is a global problem that defies simple “silver bullet” solutions or contributions by a narrow group of countries or a few industry sectors. Addressing climate change requires leadership, both by individual governments and companies. Intel exercises leadership both in reducing our own footprint and in working with others to influence the development of sound public policies. With respect to reducing our own footprint, we take seriously the work of the UN-affiliated Intergovernmental Panel on Climate Change (IPCC). The IPCC, in its 2007 Fourth Assessment Report, estimated that in order to stabilize CO2 emissions in the atmosphere at 450 parts per million (ppm) in 2050 (a goal that many climate change experts have advocated), greenhouse gas (GHG) emissions need to be reduced by 85% compared to levels observed in our own GHG emissions reduction progress against that benchmark. See the Addendum of this document for information on our progress to date.